There are as many ways to clean your energy as there are to clean your home. When you feel like you need to do a deep cleanse, it’s helpful to know which methods work best for purifying your spirit and space. Just as you wouldn’t use window cleaner to wipe down your countertop, the tools you use for energy cleansing differ depending on the job. Some common things you’ll want to regularly cleanse are your home, your personal energy and your crystals. You may be wondering why you’d add one more items to your list of things to clean — especially since energy can’t be seen! I get it. Few people love to clean. But even though your home’s energy can’t be seen, it can definitely be felt. Have you ever walked into a home that felt dark and dingy even though it was tidy? First impressions of a space are heavily influenced by the space’s energy. Places with good energy feel warm and welcoming, whereas places with negative or stagnant energy feel uninviting. The same goes for our own personal energy. Often when we talk about someone’s je ne sais quoi, we’re really referring to their energy. We’re naturally drawn to those with a vibrant energy. To keep our energy uplifted, we have to cleanse it after long days at work, arguments, exercising and anything that tends to exhaust our energy. Purifying your energy field is all about bringing fresh energy in to circulate through your body and revitalize your spirit. Not only can you do this for your own energy, you can also do it for the energy of your crystals. Make sure they’re always vibrating with the strongest radiance possible by occasionally cleansing them after use. One of the best crystals for cleansing the energy of your space is black tourmaline. I love black tourmaline because it absorbs negative energy and helps to foster a protective energy shield around you and your space. I combine the energies of black tourmaline, salt and water. Salt and water are also both known for absorbing negative energy. By placing a bowl or jar full of water, salt and black tourmaline near the front door of the home, this cleansing mixture filters out your negative energy as you enter. Follow these steps to cleanse your home and activate your protection bowl! Open your windows, and draw back the curtains to allow sunlight and fresh air to flood your space. Light your sage stick, and place it in your fireproof container. Ask aloud that the spirit of sage purify your home with positive energy. Using a feather or your hand, waft the purifying sage smoke around your home. Make sure to get the smoke into corners, hallways, closets, window sills and up toward the ceiling. Then take your piece of black tourmaline and immerse it into the smoke. Hold your black tourmaline with both hands, and set your intention for the stone by saying aloud: I ask that the highest vibrations of love and light connect with my highest self to clear all unwanted energy and any previous programming. I command this crystal to hold the intention of absorbing, purifying and clearing all unwanted energy in this environment. Thank you, thank you, thank you. Pour salt and water into your bowl or Mason jar. Carefully drop the black tourmaline into the mix, and set the jar by your front entrance. Selenite is one of those stones that never stops amazing me — learn all about it here. The energy of selenite is one of my favorites because it has such a bright, positive essence that elevates the energy of all its surroundings. It’s one of the rare stones that doesn’t need to be cleansed or charged, and can actually be used to charge and cleanse other crystals. Using selenite to cleanse your own energy helps you to focus on infusing your spirit with joy and allows the selenite to absorb the energy that no longer serves you. Use your hand to waft the sage smoke over your body. Immerse your selenite wand into the smoke, and then set your sage down. Hold your selenite wand in both hands, close your eyes, and take three deep breaths. Say aloud: I ask that the highest vibration of love and light connect with my highest self to clear all unwanted energy and any previous programming. 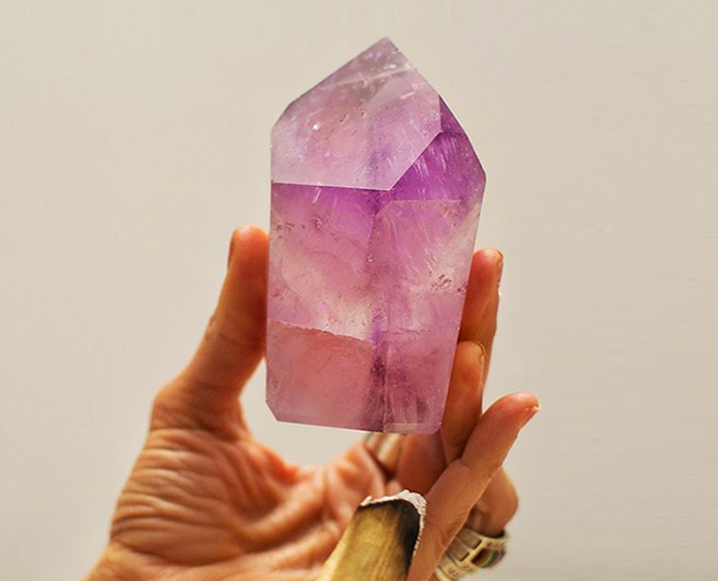 I command this crystal to hold the intention of light, pure love, and protection. Use the selenite wand to comb through your energy field by simply moving the wand over the entire front, back and both sides of your body. This filters out your negative energy and helps to lend uplifting vibrations to brighten your spirit. In a peaceful area of your home, lie flat on the floor. Set your selenite wand over your chest so that one end is pointing toward your head and the other end is pointing down toward your feet. For 11 minutes, let the energy of selenite sink into your body and fill you with light. We cleanse our crystals for the same reason we cleanse ourselves: to keep their energy pure and vibrant. When we use crystals, we often pass along a lot of our own energy to the crystal. After awhile, this tends to overburden the crystal’s energy, which becomes dull. By cleansing the crystal, we can purify and recharge its energy. Sage: One common crystal cleansing method is to use the purifying smoke of sage. All you have to do is hold your crystal in the smoke — or if it’s too large to pick up, waft the smoke over the crystal — and ask the spirit of sage to purify your stone of unwanted energy and any previous programming. Sun or Moonlight: Let your crystal recharge in the direct light of the sun or moon. Set your crystal outside to soak in some refreshing beams of light for at least four hours. Soil: There’s something rejuvenating about a return to nature and that’s certainly not lost on your crystal. Place your crystal on soil for at least 24 hours. You can also bury the crystal in soil, just as long as you place a marker to recall where you placed it! Use these tips for energy cleansing to refresh your spirit, space and crystals. If you’re looking for rituals to cleanse your connection to someone else’s energy or for more in-depth rituals to scrub away stubborn energy, check out the Space Clearing or Stop Sucking My Energy chapters of Crystal Muse: Everyday Rituals to Tune In to the Real You. Learn more about using crystals for clearing and for wellness here. Share the post "3 Crystals For Clearing Bad Energy + Cleansing Your Space"
Is there any other way you can clear your space with crystals? My husband has Asthma and burning anything will put him in an intense situation. There are some Reiki crystals charged lavender and sage smudging sprays on Amazon. I use them and like them a lot. Maybe those would work? Put them in salt water for a little while, Celtic sea salt, or any sea salt is good. Salt will allow the crystals to go back to their regular megahertz (MhZ)charge. You can just bury them in salt, too, even in a plastic bag, if you are worried about settings or, say, opal triplets or thin nacre on pearls.